There was considerable reshuffling in Can-Am in 1982. With the withdrawl of Carl Haas, VDS was now the top team and started the season with former champion Patrick Tambay. When Tambay was tempted back to F1 by an offer from Ferrari, Al Holbert filled the seat and won four races in VDS-001 and VDS-002. Holbert had disbanded his team after a disappointing 1981 in his CRC-2. The Newman Racing team had grabbed Danny Sullivan from Garvin Brown and ran a single March 827 but the bulky car was not as quick as the 817. 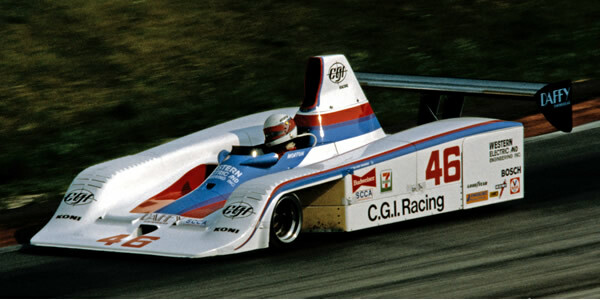 But the quickest car turned out not to be one of the 1981 or 1982 designs but the Lola T332-based Frissbee. Galles Racing had acquired the assets of Brad Frisselle's team and developed the Frissbee into a regular race winner for their FSV star Al Unser Jr. Unser was first or second at seven races and narrowly beat Holbert to the title. Geoff Brabham guested in a second Galles-Frissbee but the only other lead runner in 1982 was John Morton, his aged Lola T333 now fully converted to the latest Frissbee specification. Despite Galles' success, Can-Am now started to look a bit more like a ladder series for North American racing and less like the glamorous International series of previous years. The real culprit for this was the burgeoning success of CART, whose gravitational forces Can-Am would be unable to resist over the coming year.